Product prices and availability are accurate as of 2019-04-24 08:08:09 UTC and are subject to change. Any price and availability information displayed on http://www.amazon.co.uk/ at the time of purchase will apply to the purchase of this product. 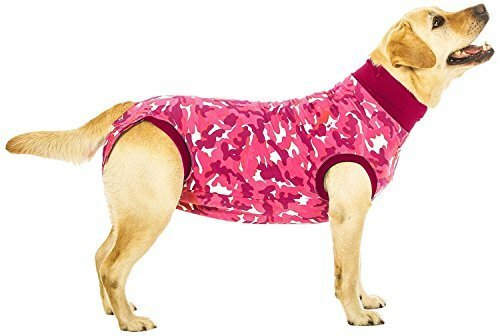 This Recovery Suit is an amazing product for dogs that have had surgery or have wounds on their body. This garmet is easy it to put on and off, it helps to keep dogs comfortable while they heal and can be used as an alternative to a cone collar! Even though this product is soft, it should not come into contact with the wound directly. It should be used, in a similar fashion to bandages, where it is put onto the dog to help cover a dressing or gauze. Your veterinarian will be able to help you with wound care and show you how to correctly use this garmet! The original full body Recovery Suit for your dog. Recommended by thousands of pet owners, veterinarians, physiotherapists, groomers and breeders worldwide. ¥ Reduces the annoyance and stresses your dog may experience, compared to wearing an Elizabethan Collar. ¥ Helps prevent your dog from touching the affected area. ¥ Our exclusive design enables air to circulate around the wound whilst keeping it dry. ¥ Helps keep patients warm after an operation. The inside of the suit is light colored allowing any fluid discharge to be easily seen. If the wound leaks, a porous sheet or incontinence pad can be inserted inside the Suit or between the double layer on the belly section. It reduces the risk of blood or urine stains. In contrast to standard shorts, it is very difficult for your dog to wriggle out of. It offers protection where it is required and helps prevent possible damage to the skin caused by scratching or biting. When walking your dog, only the rear end of the suit needs to be opened. Simply roll the underside of the suit inwards and towards the belly and secure with the added hold-up strap. Length measured from nape of neck to base of the tale.